Last week I replaced our kitchen window with a new casement window. It’s beautiful and I’m in love. But, I feel bad for the old window. The window is sitting neglected and abandoned beside our house. Whenever I walk by, it begs me for a transformation. I’m thinking I could make any one of these ideas with the old window! 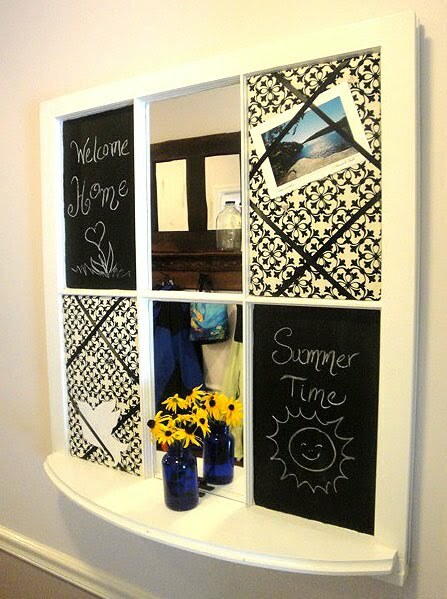 What would you do with a perfectly good old window?Have you transformed an old window and posted about it? Do tell! Great ideas!!! Can’t wait to see how you jazz up your neglected window! I especially love the kitchen island! So unique and beautiful. Here is my repurposed vintage window: http://www.alwayssomethinghome.com/2012/12/making-old-window-useful-and-beautiful.html. Patty, love your window bulletin board! Thanks for the feature, girl! What a great round up! Our old windows were aluminum sliders and totally ugly. Also replaced way before we were into doing this kind of thing, or even would have thought of it. Whenever I find windows like yours the price is astronomical. Jealous!!! Janet, which windows are you talking about? The old single paned ones? Have you looked at a local ReStore or checked with a replacement window company? They are always hauling the old ones to the dump ;-(. I have a good stash of old 9 pane windows just waiting for some love, thanks for all the ideas. My gosh girl, you are seriously creative! I love those quilted windows! Brittany, I really love this article. Those are some great DIY ideas. I particularly love the window used as a mirror. I have a few old wooden windows I would like to mount pictures to the back of the glass. What’s the best way to mount them? Diane, sorry for the delayed reply. I mounted the photos to mat board using double stick tape. Then pressed the mat board into the back of the window. If the mat board is cut exactly to size, it should be able to stay after being crammed into the corners. If not, use a little dot of clear caulk to hold it in place. What a creative way to utilize old windows, they defiantly make great creative home decor. Thank you for writing this post!